I’ve been putting off picking up my free pass to Pont du Gard for years now. Anyone who can prove they live in the Gard can get one. My friend and neighbor, Rich, said I’d murmured about it long enough. He was going to accompany me to the Mairie and translate so I could get the pass. He was going to ask for one for himself and Paula, too. After I made a trip to the Citroen dealer to order a part for my broken passenger window –another French translation nightmare — I was ready to go to the Mairie with an application in hand that I had filled out a year ago. How she knew that I could not produce the carte grise is a mystery to me. The only copy I had was a photocopy tucked away in the glove compartment of my car in the underground parking lot (gide). Trying to ask Rich was impossible. He was dead set on getting his own paperwork submitted — without a carte grise might I add. Nothing I could say in sign language would satisfy Estelle. I waved and said “avoir” and headed (in the heat) for the car in the parking gide. When I returned to Estelle, she was starting out the door to have a smoke. Kindly she turned around and went back behind the desk to “deal” with me. When I handed her the photocopy of the carte grise she asked for the original. My hands went up in the air to demonstrate “up in smoke.” That seemed to satisfy her for the moment. Until she asked for … as I could figure out … the police report. Ah! Then it clicked. Estelle thought my car was stolen! With that, she bent over and picked the crumpled paper out of the trash, smoothed it out, stamped it, then handed it back to me. Deed done. Estelle joined me as I walked out of the Mairie, almost arm-in-arm. On our way, she said something that I took to mean “let’s meet for coffee so you can learn French and I can learn to speak English.” After agreeing and exchanging our email addresses, we parted. Friends. The Barefoot Blogger is learning French! For all those ‘doubters’ out there who think the Barefoot Blogger will never learn French, here’s news. After two years living in France, and during a short visit to family in the States, I’m taking French lessons seriously. Seriously. The Rosetta Stone CDs, levels 1-5, are loaded in the computer and the headphone is out of the storage box. What’s more, every night before I go to sleep, I play games in French on my iPhone. The phone app’s called “Mindsnaps” and it’s really cool. “With 1000+ words to master and up to 40 hours of engaging gameplay, shooting the breeze in French will soon be as easy as enjoying the view from atop the Eiffel Tower. As for that difficult French accent, each word in the app features a matching audio clip provided by a native French speaker to help with pronunciation. As infantile as it looks, this silly game seems to be teaching me something. I’m already to level 10! Perhaps ‘infantile’ is exactly what I needed to inspire me! If you recall, my French tutor in Uzes gave me a good start. She’s a speech therapist, so making the right sounds is important to her. Now if I can just build on what I learned during that brief time, hopefully, I’ll make some progress. I’ll keep you posted. Wish me luck! Remember when I returned to France in April and promised I’d know French by Christmas? Here’s the update in mid October. Like those 20 pounds I was going to lose. It’s just not happening. My French teacher, Annabelle says it’s all about priorities. She says that if I spent as much time on learning French as I do on writing blogs, I’d be on track now. So friends, if you enjoy reading the blogs as much as I enjoy writing them you’re to blame, too. I mean, which would you rather do? Sit and study a book, listen to CDs and French radio? Or go out on an adventure where you meet all kinds of people and run into new and fascinating things? Judging from your silence, you agree blogging is more fun. There are days when I don’t get into any trouble at all not knowing French. Of course that’s mostly when I stay inside writing posts. Every once in a while someone will congratulate me on saying a simple sentence in French. My recent visitor from the States, in fact, told me she was impressed that I could communicate so well. She didn’t see I constantly use sign language and she didn’t recognize the mispronounced words. Leaving France before Christmas is the excuse I give now for not learning French by the holiday deadline. A trip to Istanbul and a tour of Nepal and Kathmandu is on the calendar for mid November into December. With that there’s planning, packing and studying up for another Barefoot Blogger adventure. When I return to the States for a visit in December ‘ll get back to my lessons. It’ll be something to do and help keep me from getting homesick for France. Maybe my grandson who will be nine-months old can learn along with me. They say that six-months is the perfect age to start a second language. Perhaps we’ll make a bet. Studies say the best time to learn a language is to begin when you are six months old. If you, like me, missed that window of opportunity, then you have until age five to speak the language like your native tongue. “ Experts attribute greater difficulty to mastering a language after this time to the physiological changes that occur in the brain at puberty (less communication between the right and left hemispheres)” says sources at iVillage. “Physiological changes at puberty” … ??? Trust me, trying to learn French was the last thing I was thinking about at thirteen! 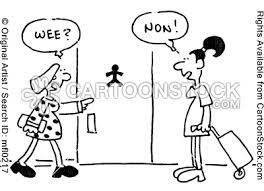 So now that I’ve chosen to live in France, without knowing the language, learning French is a quite a challenge at my ripe old age. Nevertheless, I’m charging forward and have promised myself to learn French by Christmas. Yes, you heard it and it’s in writing. Now on with the lessons. A big difference between French and Southern English is how you use your mouth in speaking. Southerners tend to use wide mouth motions. We seem to grin when saying some words, then drop our jaw when saying others. Southern: “Precious” is said with a big smile. Southern: “Ya’ll” can’t be said without opening wide. French, on the other hand, seems to be all about using tiny, pinched lips. In other words, I have to learn to shut my mouth! Learning to speak French is becoming an issue for me. Try as I may, it is a bit of a pain. Perhaps it’s because my brain is full trying to deal with learning how to deal with everyday life. I want to learn French. I really do. However, there are challenges everyday that seem to take up my learning time. Bedding is something I can’t seem to understand. Before in one of the blogs, I mentioned how confusing it is to choose a bed size. There are more configurations and iterations that you want to know. Just when I think I’ve got it figured out, I mess up. For example, I’m trying to fix up the second bedroom for my first guest from the US. The daughter of one of my very dear friends is studying in Europe and she’s making a special visit to see me in Uzes! She’ll be here next week. 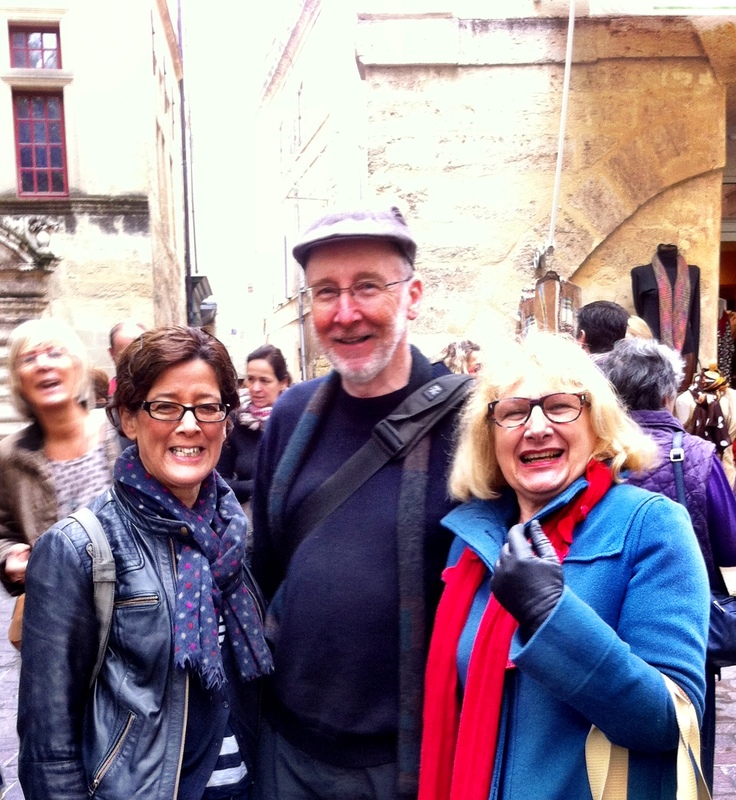 Yesterday I drove my new friends from Australia to the train station in Nimes. They have a vacation home here and were heading back to Australia by train with an overnight in Paris. The large Carrefour store is in Nimes, plus a few other stores I’ve wanted to check out. So taking my friends to the train station was a perfect excuse for a shopping trip. Yes, I know I’m picky. Finding the right sized linen for a bed seems to me to be important. I should have thought about that when I purchased the two 80x200cm beds instead of 90×190. Who knew there are no linens to fit. The guy that sold them to me certainly must not have known I’d have these problems. Or maybe he did. I couldn’t understand everything he was telling me in French. Conforama had fitted sheets for 80x200cm beds! See for yourself. 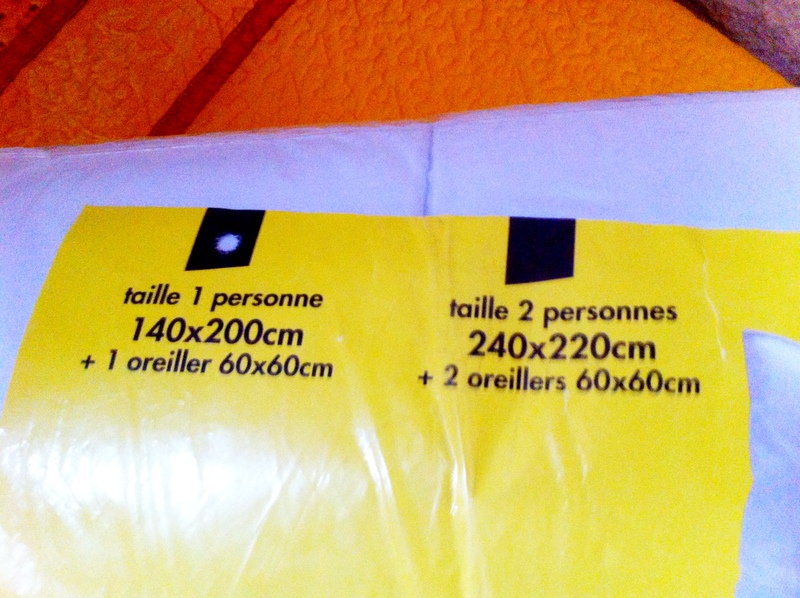 The package says: 2 x 80×200. 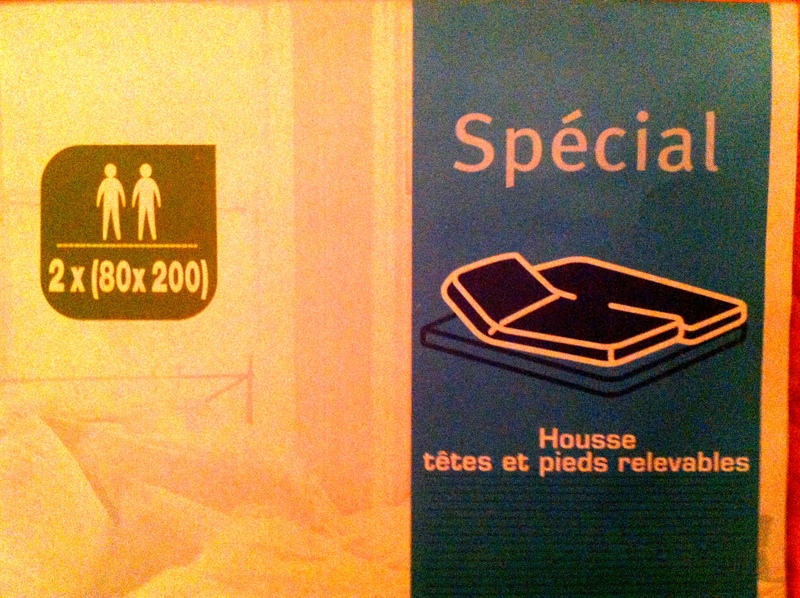 There’s even an illustration of two beds. Voila! I was beginning to figure it out. Since the beds are meant to be pulled together to make a queen-sized bed, they must sell the sheets together. I could hardly wait to get home to make up the beds. 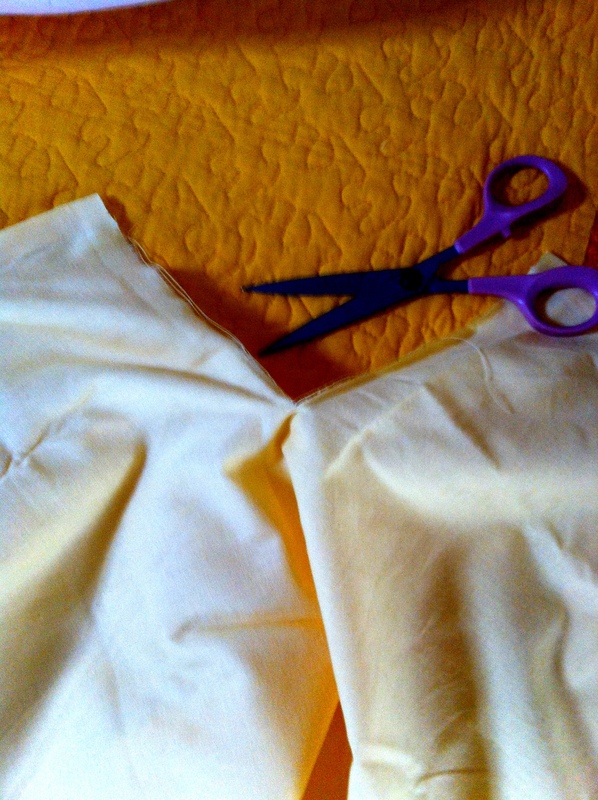 The fitted sheets were sewn together in a section down the middle to fit the queen bed! Now what to do? I cut the housse in half! So what if there are raw edges. My guest will never know! Never learned French, never owned a duvet. Two pitfalls for living in France. Duvets have never been my thing. To me, here’s something untidy about a bed that’s not tightly put together. 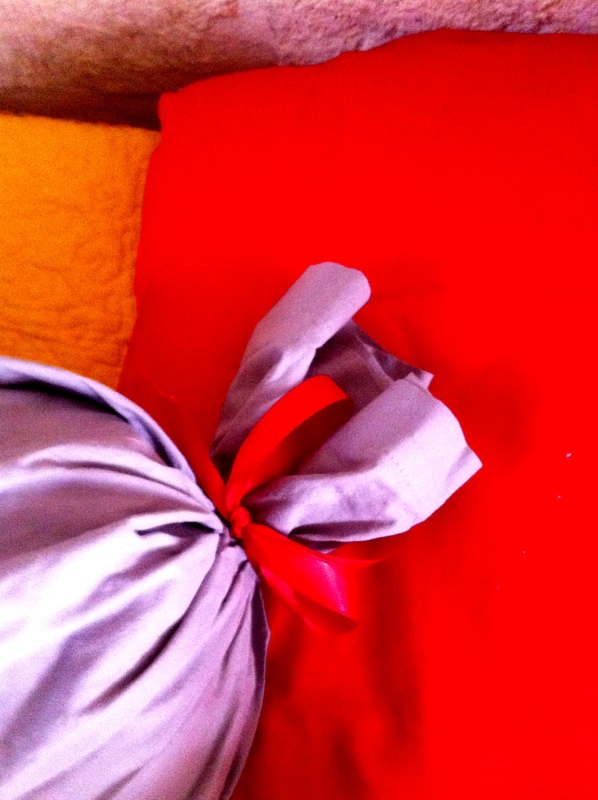 Therefore, the joy of stuffing a duvet into it’s cover is an art I never mastered. Like learning to speak French. Here duvets are the norm. Top sheets are not. 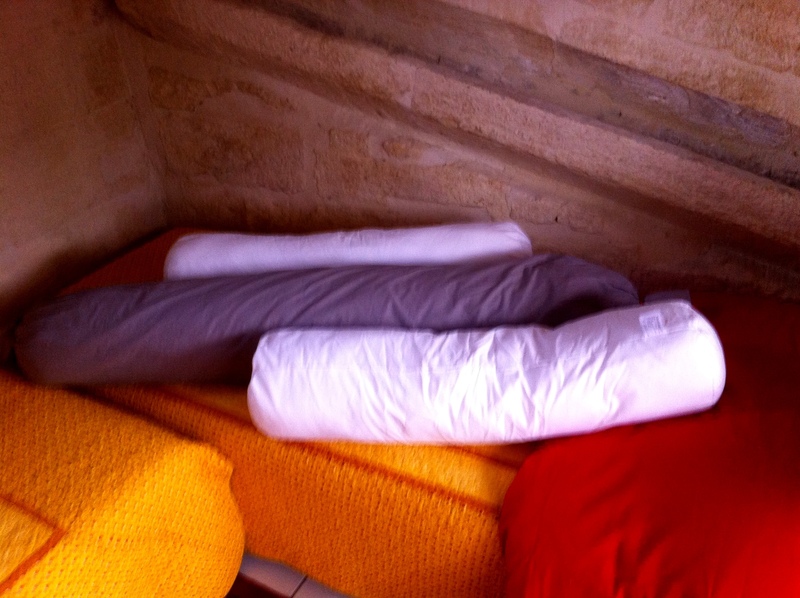 So to make up a bed properly in France, I had to convert. Like other bed linens, the couette and the housse de couette come in a gazillion sizes and permutations. Amazingly, I chose the correct size for the two guest room beds. Slipping the couette into the housse de couette was a breeze. Especially because there’s a tiny slit in the top to the housee de couette. It allows you to stick you hand in to grab the end of the couette. Perhaps the American version of duvets have a similar design. If not, the French have something on us. If the elementary French is boring you, I apologize. These simple lessons are for those like me who don’t know French and for those who are easily confused. OK. Another head-scratcher. An “oreiller” is an ordinary pillow. Easy enough even though they are all shapes and sizes. It’s the an odd-shaped “pillow” named “traversin” that’s a puzzlement. I’ve seen similar in the States, but they’re everywhere here. The most common size is like the big one shown in this picture. The smaller ones I bought from the same man that sold me the beds. Maybe when he told me I wouldn’t find sheets for the 80cm beds he also mentioned the same problem for a small-sized traversin. The large one you can decorate quite nicely with ribbons and bows on the ends. 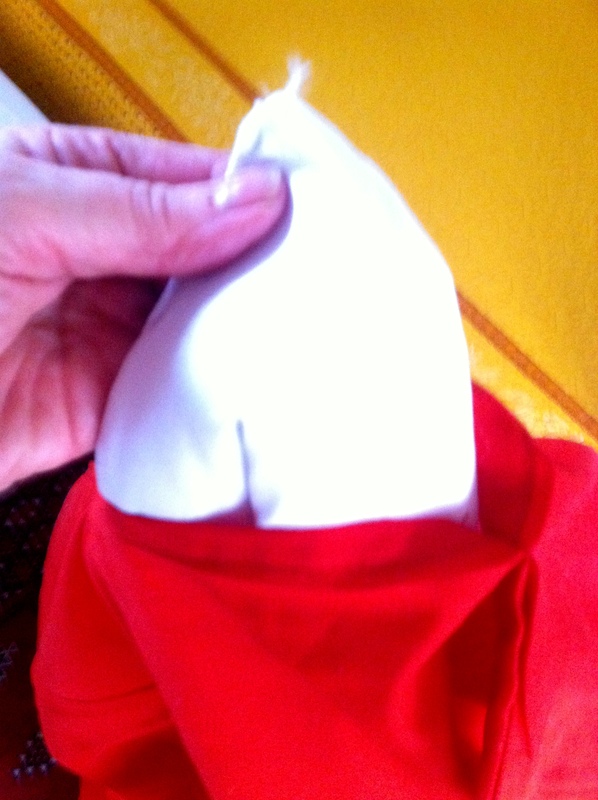 The smaller ones you hide under a stack of pillows so the edges don’t show. Yes, I cut a large traversin cover (taie) in half. Je Parle Le Français? Non! Today has been challenging because I don’t speak French …at all. Worse, I keep popping up with very badly enunciated Spanish words! So now I have a new BFF at the Office of Tourists. She speaks English. Renting a bicycle for a few days was my main objective for the day. There are so many back roads and adjoining towns that I want to explore. A car isn’t practical since parking near the apartment is nearly impossible. I headed to the Uzes tourist office where the very accommodating agent gave me information on a bike rental place. She drew arrows on a map to show me the way and, also, suggested I call in advance to make a reservation. Instead of asking her to make the call right then, I walked back to the apartment and called Oliver at the bike shop. Big mistake. Olivier couldn’t understand a word I said. So, back to the tourist office to ask my BFF to do me the favor. Lesson learned: in person you may get away with not speaking the local language; but, not on the phone. Get a translator. The walk to Oliver’s was a piece of cake. Negotiating the two day rental wasn’t so easy; but, it worked out fine with a little sign language and lots of laughs. Olivier escorted me back to town on his bike. He probably wanted to make sure I was able to ride a bike better than I could communicate. Did I mention he’s adorable? Shut my mouth. He’s younger than my sons. Some of you are showing an interest in the food I’m enjoying. I’m certainly not a food stylist or photographer. However, there’s something inspiring about this place to try doing both. Arranging meals in a setting before eating it is actually very entertaining. It seems to keep me from gulping my food down too fast, as well. I might try it at home. Light breakfast due to the rich food for dinner last night. (See “Settling in” post from yesterday.) The best EVER granola, off the shelf at the local grocery; strawberries from the Saturday Market; and fresh pressed Kenyan coffee. 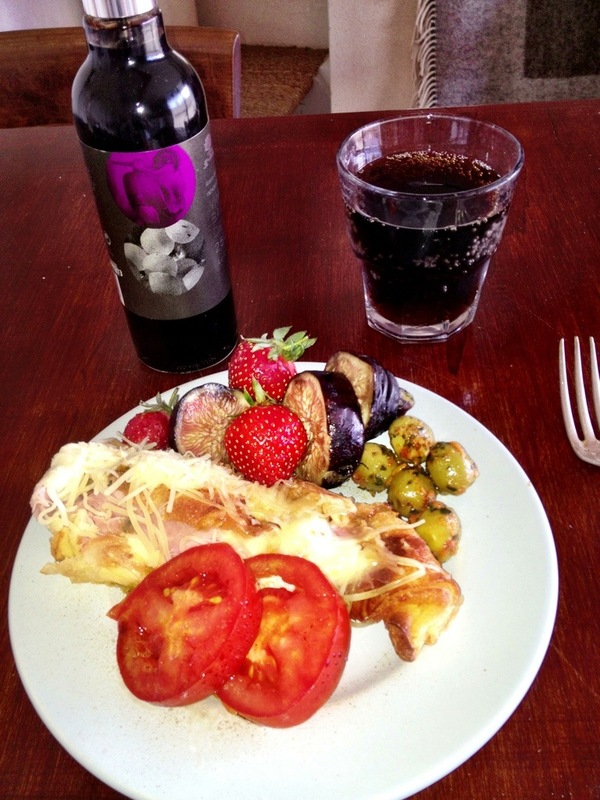 Saturday Market ham and cheese pastry; herbed olives; figs and strawberries. The pastry was filled with a soft cheese with a consistency close to cream cheese…but smoother… and topped with shredded Gouda; accompanied by the “drink that refreshes”, Coca-Cola Light. Another light meal in anticipation of a full day’s bike riding tomorrow. Fois Grau (reserved from last night’s restaurant dinner); vegetables, cheeses and olives from the Saturday Market; crouton crackers; plus, prize-winning olive oil and wine from Uzes. Note: not a dime spent on food today.